The occasion was the opening of the renovated Mauritshuis Royal Picture Gallery in The Hague, a jewel-box museum with a small (with just 800 artworks) but extraordinary collection of Dutch and Flemish Golden Age paintings. Its holdings also include Vermeer’s “The Girl With The Pearl Earring” and Carel Fabritius’ “The Goldfinch,” two paintings that have been the inspiration for two highly successful novels. Lately, a lot of people have been asking me why one museum contains so many works of art that have been explored through recent works of literature. It’s a good question, and one I’ve been mulling for a while. First, a disclaimer: Until I first visited the Mauritshuis in 2006 to start doing research for my own novel, I didn’t know that “The Girl With The Pearl Earring” was housed in the same museum, even though I was aware of Tracy Chevalier’s novel of the same name. And I didn’t hear about Donna Tartt’s novel, The Goldfinch, until my agent was shopping my book and her publisher rejected mine on the grounds that “two such deserving novels shouldn’t be competing on the same list.” I took that as a great compliment – and it’s one of my favorite rejection letters ever. No, back in 2006, I used to visit the Mauritshuis about once a month, traveling down to the Hague from Amsterdam, sitting with the painting for about an hour a time, looking, thinking, listening to art patrons and docents talk about the painting, scribbling notes in a small Rembrandt notebook I’d bought in the gift shop downstairs – basically just soaking in the work. It was a work I loved before I came here, of course, and I had been looking at it in reproduction for a long time. My father purchased a 9×11 inch poster in the same gift shop downstairs in 1965, just after he finished medical school, and he hung it in his study. That’s where, as I child, I looked at it quite often. Seeing the real work in person was something else entirely. First, I was awed by the size of it – nine figures on a canvas, all life-size. 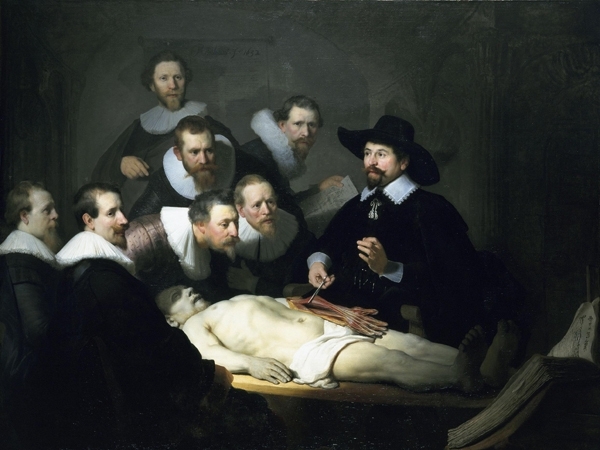 In that intimate gallery setting, you really feel as if you’re in the dissection chamber, in and among the surgeons. Looking at a dead body that’s right there before you. The faces of the live men are vivid, colorful, ruddy-cheeked. The dead man is pale, but fleshy, a human being too. Second, I was amazed by how much I could discover by just sitting with it in that gallery, observing. It’s the kind of painting that’s almost like a great jazz recording, which you can listen to again and again and always discover something new. I found inspiration sitting there, sometimes when I was carrying around emotions and thoughts from my own life, a few times in moments when I was too tired to even look anymore. One morning, I was particularly sad because a man I’d fallen in love with in Amsterdam was going off to travel, and was leaving me. I looked at the dead man in the painting, stripped almost bare, his body pallid and naked, and I thought: someone loved that man, too, and he left her. First, he left her through wandering – he was a thief and a vagabond – and then he left her for good. It was the start of one of the key narratives of my book. For the last two years, the Mauritshuis has been closed for expansion and renovation, and in the meantime “my” painting has been exhibited at various museums, including the Gemeentemuseum, another gorgeous museum also in The Hague. I went to visit it there two months ago, and felt like it was a bit far away from me, although I could still walk up to it and see it up close. The gallery spaces were just much larger, and in the broader context with many more works surrounding it, it just felt less intimate. Last night, before I read from my novel, I snuck back upstairs to the gallery to see “my” painting in the room where I’d visited with it so many times before. It felt like visiting a dear friend. It occurred to me then that perhaps the reason the Mauritshuis’ collection has inspired works of literature is that when you’re in the museum you feel a kind of personal intimacy with the paintings that’s rare in larger museums – perhaps Chevalier and Tartt felt that too. 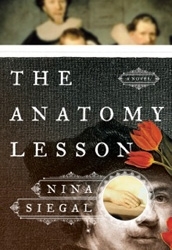 For me, that moment of being alone in the room with “The Anatomy Lesson,” eight years later, now with the novel finished, was a kind of homecoming, the circle finally complete. Our relationship with the Divine must also encompass a relationship with the world that surrounds us.